Some of the body’s most important functions are produced by the thyroid gland. Functions such as breathing, heart rate, body weight, muscle strength, cholesterol levels and much more. It is important to ensure that your thyroid levels are balanced, overactive or underachieve thyroid levels affect your day-to-day life. ProBLEN Thyroid can remind the body to produce the right amount of thyroid, thus avoiding an over or underactive thyroid. The thyroid gland uses iodine from your food intake and produced two dominant hormones, the T3 hormone, and the T4 hormone. These hormones travel your body through your blood and reach almost every cell in the body. In addition to many natural remedies and foods that may help improve your thyroid issues — We recommend pairing with our Thyroid Hormone booster. Herbs like Licorice Root, Rhodiola, and Ginseng can also help with over-active or under-active thyroid issues. Studies show that the most effective natural herb to include into your diet is Ashwagandha. Ashwagandha is proven to heal thyroid and adrenal issues — Ashwagandha is an adaptogenic herb, which means that it also helps those dealing with high-stress situations. Foods such as Yellowfin Tuna, Cooked halibut, grass-fed beef, Beef liver, Eggs, and Spinach are among some of the best foods to improve and balance your body’s T4, which is essential for a healthy thyroid. Vitamin B is also known to help balance an unbalanced thyroid, the Vitamin help to treat fatigue and can be easily found in several foods. One of the most effective natural thyroid supplements is probiotics — many know that probiotics are essential for a healthy gut and digestive system. But, many thyroid conditions have seen improvement from the intake of probiotics. 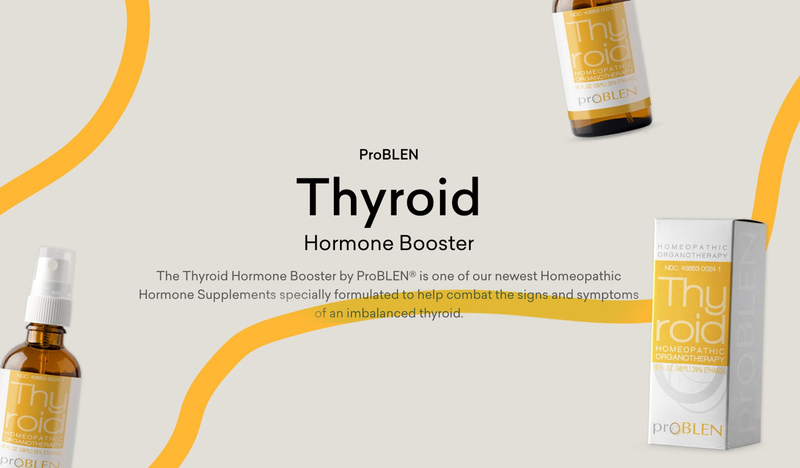 Natural remedies are extremely beneficial for healthy lifestyles but in the case that your body doesn’t respond to natural remedies, our Thyroid booster is proven to help improve imbalances. ProBLEN Thyroid can play an important role in balancing thyroid functions! Both T3 and T4 hormones released through the thyroid gland travel through the bloodstream, converting calories and oxygen into energy. If this process does not work correctly and becomes imbalanced, due to malfunctions within the thyroid, then calories and oxygen cannot convert the energy properly, and they'll begin to show signs of immune system breakdown. Let ProBLEN help the thyroid rebuild its defenses with ProBLEN Thyroid Homeopathic Organotherapy.